I’ll be delving into individual modes in more depth in the coming weeks and months ahead but as a preliminary step, I wanted to get into modal arpeggios a bit as they’ll be important components in future lessons. Since chords and scales are made up of the building blocks (notes), they are essentially 2 sides of the same coin. 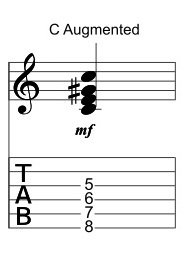 If we remove every other note of the first for notes we can see arpeggiated versions of the triads associated with those modes. While 2-string arpeggios are often neglected by guitarists, they are certainly worth investigating for helping with visualization. Now I’ll apply each of these arpeggio shapes to the C major scale starting with the root position. As a reminder here are the triads of the C major scale. Since the fingerings are on 2-strings, they’ll be the same on the E/A, D/G and B/e strings. Here are the arpeggios in 1st inversion. Again, since the fingerings are on 2-strings, they’ll be the same on the E/A and B/e strings as well. And finally, here are the arpeggios in 2nd inversion. At the top of the page, I showed how I extracted arpeggios from ascending 2 string patterns. This same process can be applied positionally. 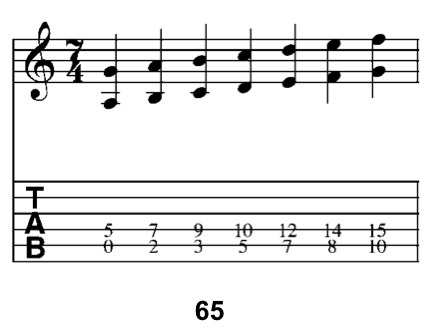 For example, here’s a 3-note per string C major scale played in 8th position. Now I’ll apply each of these arpeggio shapes to the C major scale starting with the root position. To create a modal arpeggio, simply remove every other note. Doing so with this scale creates a C Ionian modal arpeggio. Modal arpeggios are sonically cool because they convey the full sound of the mode but break it out of a scalar pattern. Modal arpeggios are cool in this method, because if you can visualize a scale then making the arpeggio is relatively easy. The “problem” with the Ionian mode in general is that the natural 4th is an avoid tone over major 7th chords with the same root. (i.e. C Ionian played over C maj7). For this reason, I generally avoid Ionian as a mode and instead focus on the major scale for visualization purposes. 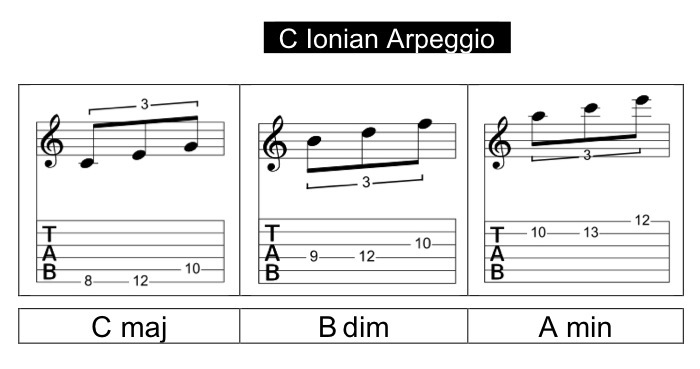 With that in mind, here ‘s another approach for using this arpeggio. I really dig playing this particular arpeggio over D minor – to create a D Dorian type of sound. In the example below, I’ve used the C and the E pitches on the low E string to encircle the D (one note above and one below) to help emphasize the D minor 13 sound of the arpeggio and end it on the 9th. Take a close look at the positional modal arpeggio! If you look at it as a group of 3-note shapes you’ll see that it’s actually made of of 3 triadic arpeggios: C Major, B diminished and A minor. Going back to the 2-string scalar observation in part 3 of this post, as the pitches ascend, the related arpeggios descend. This is true of any of the modal arpeggios – so it might be a cool way for you to visualize it! Try it with your own arpeggio forms! and then over whatever other tonal centers inspire youI hope this helps! As always, thanks for reading! I wanted to post a lesson up that uses one of my approaches to harmonizing scales from my Harmonic Combinatorics book. It’s a cool way to not only get away from stock voicings but also to generate new lines as well! I’m using C Major as the tonal center for this lesson but the approach can (and probably should be) be adapted to any scale. A couple of lessons ago, I talked about the modal microscope – which was a term I used to discuss examining modes on multiple levels and the advantage of viewing modes as subsets of a parent scale. Before I get into the harmonization approach I want to expand on this idea of the microscope analogy and apply it to harmony. 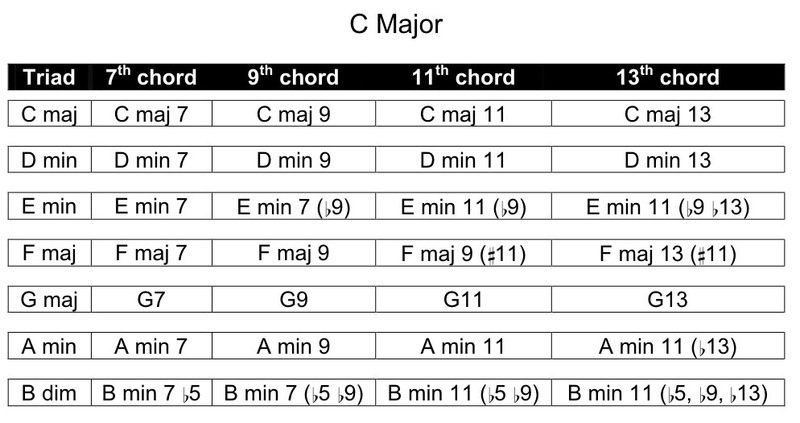 If I harmonize a parent major scale in the key of C, I’ll end up with the following chords on each scale degree. So if you’re playing in the key of C and want to get into more harmonic depth on an E minor chord, it’s time to reach into your chord bag and pull out your stock minor 11 (b9, b13) voicing. Oh, you don’t have one? Don’t worry – most guitarists don’t. Learning stock voicings and inversions for this specific chord form probably isn’t the best use of your time anyway. Using the microscope analogy, this is really looking at the chord on a 2x setting. E min / min7 / min7 (b9) / min 11 (b9, b13) chord. Once you are aware of the types of sounds that are created from various chord types, you can start thinking about chords and chord voicings on the macro (i.e. parent scale) level. This means that if I’m playing over a D minor chord and using notes from the C major scale, I don’t have to analyze each indidual chord because I know it’s all under some type of generic D minor 7/minor 9/minor 11 or minor 13 umbrella. Harmonic Combinatorics refers to a process of identifying “countable discrete structures” harmonically. In other words, it examines unique combinations of notes on all of the possible string combinations for the purposes of develop harmonic and melodic possibilities. One way to do this is through a method that I use to generate unique ideas through a process that some people refer to as spread voicings. It’s important to state at the outset that the method I’m employing is only one possible way to approach this exploration. I’ve taken this approach to maximize the number of unique voicings, but you should feel free to take any of the rules that I’ve applied to this approach (like eliminating octaves) with a grain of salt. The object is to gain new sounds – so change the patterns here in whatever ways necessary. Here’s an approach that will give you more voicings and lines than you might have thought possible. Step 1: Write out a scale and write the scale degree under each note. 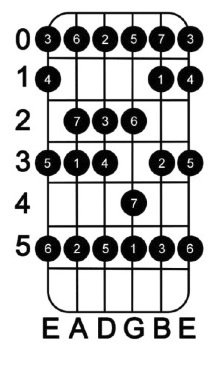 Step 2: On a blank chord sheet – write out the scale degrees on each string up to the 5th fret. 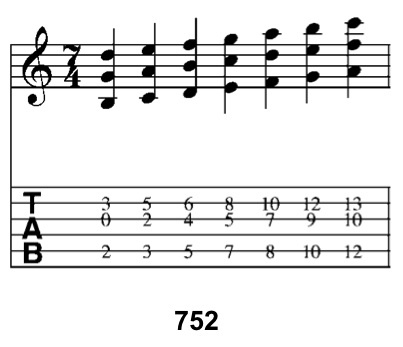 (To clarify: The numbers on the left hand side of the diagram are the fret numbers ). Step 3: Starting with the lowest note on the lowest string, write out all the initial voicing of all possible 2, 3, 4, 5 or 6 note harmonies by scale degree on different string sets. At least one note in the voicing has to be the lowest on a string. If you look at 614 on the G, B and high E strings you’ll see that it’s really the second voicing of 573 on the frets below it. Having at least one note be the bottom note on any string will help ensure that you’re not just working out voicings that you may have already done. The highest fret to be used in the first voicing is the 5th fret. This last step is going to produce some voicings that aren’t playable on the lower frets, but might work in the upper registers. Step 4: Select a string set and move the voicing in scale-wise motion up the strings to the octave. For the purposes of this lesson – I’m going to focus primarily on 3 string groups, but this idea is applicable on any 2-6 string set of strings. (It’s worth mentioning that – Harmonic Combinatorics does all the work for this process for all string sets – (it’s also why it’s over 400 pages long!!)). 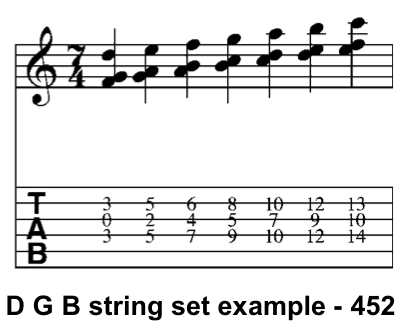 I’ve written out an example based on the D, G and B string set (i.e. 432) and gone with an initial voicing of a F, G and D (or 452). This creates seven different voicings which could be played as a modal chord progression, used as the basis for a melodic idea or even isolated into individual chords. If this process yields even one chord that you like it’s worthwhile. Check out these chord sounds over A. In addition to possible comping ideas, these can be arpeggiated for melodic ideas as well. there is almost always an easier way to play it on another string set. If you find a voicing in C Major you like, just move it to whatever other key you’re playing in. To create all of the C Melodic Minor (i.e. Jazz Minor) voicings – just change any E to Eb. To create all of the C Harmonic Minor voicings – just change any E to Eb and any A to Ab. Now I’ll talk about making melodic lines from this material. As I mentioned earlier, these voicings can be played as melodies simply by playing the notes one at a time. In The GuitArchitect’s Positional Exploration and the GuitArchitect’s Guide to Modes: Melodic Patterns, I’ve outlined a series of methods for generating melodic variations. But since this approach is about combining things, it makes sense to at least look at some melodic possibilities with regards to note choice. I’ve decided to take a three-note voicing as it offers enough possibilites to be interesting, but not too many to be over-whelming and have chosen this pattern simply because I like the first voicing. but when you play it with the B as the lowest note it sounds like a B minor with the b3rd on the B string. If you play it without harmonic backing, try changing any F natural to F # and it should sound more pleasing to you. 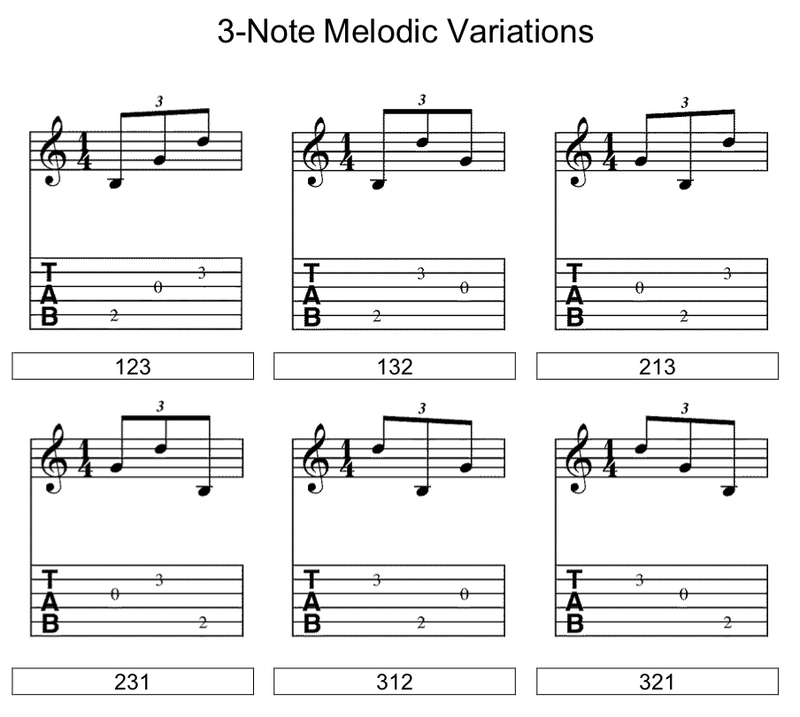 There are six unique melodic variations of any three-note chord or pattern. These numbers represent note order. 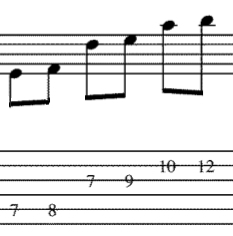 Assigning 1 as the lowest note and 3 as the highest – here are the unique variations on the first three notes. 1. I’ve notated this as triplets for ease of reading, but the very first thing you should probably do (after getting the notes under your fingers is look for a more musical phrasing). Combining the first 2 chords into a 6-note pattern allows even more flexibility. Here, I’ve moved the number order around and made a more interesting line. When I add a low E root, I get a cool little Phrygian phrase (with a couple of notes snuck in on the high E string). The GuitArchitect’s Positional Exploration and the GuitArchitect’s Guide to Modes: Melodic Patterns, has a systematic approach to exploring these types of variations. Having said that, those of you who want to do the work, could just write down a collection of numbers and apply them to different ideas and see what happens. The first important thing, however, is to experiment with different rhythms (including rests! ), phrasings (like slides, hammer-on/pull offs) and make some music out this raw material. make what you keep part of your sound and discard (or ignore) what you don’t use. I cover some other approaches and break down the theory a little more in depth in Harmonic Combinatorics but I hope this lesson here helps and if you like this idea – you should check out the book (if you haven’t already)! I wanted to post a lesson that uses some of the material from my Positional Exploration book in a way that I didn’t get to cover in the text itself. Back in November when Guitar-Muse posted the second part of my interview with Rob Balducci, Rob brought up a process he called chord morphing. When I saw it in the video, I slapped my head forehead loudly as I realized that while I mentioned that any of the melodic exercises in the Positional Exploration book could be played as a chord, I didn’t include chord tablature. Rob play this up on the 12-15th fret, but I’ve moved it to a low pitch of C for the purposes of explanation. He then goes on to lower each note of the chord chromatically one at a time until he ends up with an augmented chord a 1/2 step away from where he started. I’ve detailed a sample of this below with analysis, when playing it the key to remember is keeping your fingers down and only moving finger playing the individual note that changes. see how different chord forms can be created by modifying existing voicings. Then, because I couldn’t leave well enough alone, I started thinking about augmented chords in general. They’re neat little things because they’re intervallically symmetrical and any note in the chord can be the root. You can also use them to visualize all of your 3-note major and minor inversions. In the following chords, I’ve taken the original 4-note voicing I had (with doubled C) and sharped one note at a time which creates A minor, F minor and Db (or C#) minor. Since augmented chords are symmetrical – the fingerings for inversions repeat every Major 3rd (i.e. 5 frets higher). The next step is to move the entire pattern up 5 frets and repeat the process of converting the chords to minor. Going up another 5 frets gives up the final inversion. Once you get used to manipulating the augmented patterns to create all three minor chords, try taking one minor voicing (like A minor for example) and using the augmented visualization, try visualizing every inversion of A minor both across the fingerboard as well as on each string set. if you flat any note in an augmented triad, the flatted note becomes the 5th of a major chord. You can guess that the next step would be to apply this to all of the above inversions like you did with the minor. If all of the above chords are related from C / E / G# augmented, then that augmented chord could be used as a bridge to cross bridge chords in very different key centers. A minor – C augmented – F minor. A minor – C augmented – Db minor. For those of you who have read my glass noodles post, you’ll see where this is going for a future lesson. Enjoy the new voicings and thanks for reading! PS – If you like this idea, you might find my Positional Exploration book, Harmonic Combinatorics Book, Chord Scale Book or Melodic Patterns book really helpful in generating new melodic ideas or approaches. The official version of this book has been released as both a print and PDF version, so I’m leaving this page up as a pointer for historical purposes (and so that people who are interested in the book can get some more detailed information). All ordering information (including an overview of the book and jpegs of sample pages) can be found here.